Scientists are not in complete agreement about how cholesterol circulates through our body, but they believe the liver makes bubbles of proteins combined with triglycerides (fats) and cholesterol, called lipoproteins. A Very Low Density Lipoprotein (VLDL), the largest of these, deposits triglycerides in fat cells and muscles to be stored until they are needed. When the VLDL releases triglycerides, the bubble becomes smaller and then carries the cholesterol to the cells for metabolism. 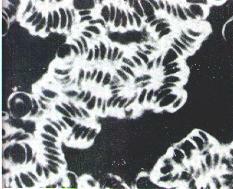 This smaller cell changes to a Low Density Lipoprotein (LDL). LDL is often called bad cholesterol, since it adds to the total cholesterol already in the bloodstream. When there is more cholesterol than is needed by the cells, the liver's LDL receptors try to filter it out to be excreted as waste. Saturated fats can prevent these LDL receptors from doing their job. When meat, fish, fowl, eggs or dairy products are eaten, additional cholesterol is added to that which we make ourselves and it circulates in the bloodstream, eventually accumulating on the walls of the arteries. Cholesterol is not deposited inside an artery like minerals deposit in a water pipe. Rather, it swells cells in the artery lining, causing lesions which result in plaque formation. The cholesterol you get from what you eat, made outside your body, is never "good" cholesterol. When excessive fat enters the blood, it causes the red blood cells to stick together. This reduces the oxygen supply to the inner one-third of the artery wall. This damages the cells and produces a swelling of the wall. As the cells are pulled apart from this swelling, fat and cholesterol leak into the tissue. This disrupts the normal healing process and begins the formation of plaque. If people who eat the typically high fat standard American diet could see their blood sample after 8 hours, with its layer of yellow-white fat floating above the red and sticking to the sides of the glass tube, it would be easier to motivate them to eat more sensibly. It isn't just animal fats that are dangerous. Vegetable fats also cause the red blood cells to clump together and not flow properly through the capillaries, where there is only room for one red blood cell at a time to pass. This reduces the oxygen and nutrient supply to the cells and sets the stage for cancer and many other diseases. Unlike amino acids and glucose, which are carried directly to the liver by the bloodstream, fats are absorbed by the lymphatic system. They bypass the liver and are taken directly to the blood system. Then they are pumped by the heart all over the body. So think twice before you load up your salad with oil, even "healthy" olive oil. 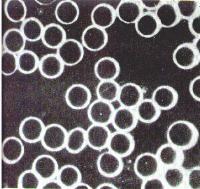 The pictures below show normal blood cells on the left and blood cells that are clumped together on the right. Why does plaque form in the arteries and not the veins? It is because the arteries are subject to fluctuating pressure from the beating of the heart. This constant stress makes the arteries more likely to be damaged, setting the stage for cholesterol to enter the tissues. removed from a coronary artery. Another theory states that it is not ordinary LDL cholesterol that causes plaque formation, but LDL cholesterol that has been damaged by oxidization. This damage might be caused by certain forms of cooking, for instance in the scrambling of an egg in the frying pan instead of boiling it in the shell. Exposure to oxygen in the presence of high heat will damage the cholesterol in the yolk. The liver also makes a High Density Lipoprotein (HDL), which holds less cholesterol than the LDL. When this circulates, it can pick up cholesterol and bring it back to the liver, where some of it is filtered and eliminated. HDL is often called good cholesterol, since it can be beneficial in lowering the total cholesterol in the blood. The body makes HDL in an effort to reduce excessive cholestrol levels. When total cholesterol is lowered in response to a more healthful diet, the body usually manufactures less HDL and the HDL level can also decrease. This is not cause for concern. Worldwide, the people with the lowest HDL levels have the lowest incidence of heart disease. That is why it is foolish to be overly concerned with HDL and LDL values. Total cholesterol is the important measuring tool. Studies of people in two countries illustrate how what we eat can affect cholesterol. In 1983 researchers from Cornell University in New York, the Chinese Academy of Preventive Medicine in Beijing, and Oxford University in England began gathering data in The China Project on how people lived and died. A scientifically selected sample from every single county, a total of 6,500 people, has been under examination since 1983. Their food intake and life habits have been carefully logged, and they have been subjected to many medical diagnostic tests. The typical Chinese eat very little animal protein or saturated fats. Their usual cholesterol levels (average 88-165) are lower than Americans (average 155-274), and coronary heart disease is rare among Chinese. Death from colon cancer is also extremely low. The Japanese, who traditionally consume very low levels of saturated fats, have the lowest levels of cholesterol and heart disease of all industrialized countries. Men in China have a 1-in-100,000 rate of prostate cancer. Chinese-American men living in San Francisco have a 19-times-greater rate of the disease. Lowering cholesterol is best accomplished by changing the foods you eat. Eliminating saturated fats and reducing the cholesterol in your diet are both important to good health. Even as little as 5 milligrams of cholesterol a day may make it difficult for you to bring your cholesterol level below 150 mg/dl, where it needs to be to begin to reverse the damage already caused in your arteries. It was once thought that anything under 200 mg/dl was a safe cholesterol level, and many physicians and health foundations are still satisfied with that number, but more recent research shows the reversal process improves and the risk of heart attack lowers most when the cholesterol level is below 150. Above 200, for every point cholesterol is reduced, the risk of heart attack is lowered by 2%. For people in good health and who have no family history of heart disease or other risk factors, there may be no immediate danger in consuming foods with small amounts of cholesterol. But those with an elevated risk of heart disease should avoid dietary cholesterol. Since saturated fats prevent the body from removing excess cholesterol, these also should be reduced or eliminated. Some people are unwilling to give up the many foods they have come to enjoy and consequently cannot attain a level of 150. Others do adopt a vegan lifestyle and STILL cannot attain this safe level. Both these groups of people need to go further and learn about the Chemical Control of Cholesterol.